Performers in the Yosakoi are well known for their unique dances and costumes. Photo Courtesy of Kouchi Prefecture Sightseeing Convention Association. Many of the festivals in Japan have long histories, but the Yosakoi Festival of Kōchi City is relatively new, having been established in 1954 by the city’s Chamber of Commerce to promote economic recovery in the post-war era. Every year for four days, from August 9 to 13, about 16,000 people in 150 teams gather at locations throughout the city to dance in performances and competitions to the accompaniment of naruko, or wooden clappers. 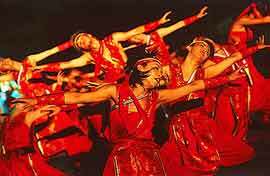 The rules say the dancers must use the traditional folk music of the area, the Yosakoi Bushi, but many teams arrange the music using the rhythms of rock music, samba, jazz and other modern styles. Musical instruments range from the traditional Japanese odaiko (great drums) to electric guitar, and costumes are diverse, including both traditional happi coats and T-shirts. This characteristic of creativity in the Yosakoi Festival may be the attraction that pulls in the crowds of people.